Property Inspection– A trained Prime Pest Solutions technician will come out and inspect the grounds around your home. We will be looking for places that might be holding water. For example, children’s toys in the yard, decorative bird baths, clogged gutters, trash cans, old tires, and possibly misdirected downspouts could lead to breeding sites for mosquito larvae that will lead to adult biting mosquitoes. We will located these areas and give you suggestions on how to keep these areas clean and dry. Larval Control– There could be possible areas around your home where water can’t drain or dry out. (Drain ditches, driveway drains, & retention ponds are examples of these particular areas) In these areas, we will apply a larvacide. Larvacides reduce the number of “wigglers” these areas of standing water. Prime Pest Solutions trained pest technicians place these products are placed in specific locations around the home. Adult Control Treatment– During the daytime hours, adult mosquitoes rest on the back sides of leaves on bushes and trees. We use power blowers/sprayers to aggressively apply a treatment around the perimeter of the home. The blower-sprayer gets the product through the thick brush and shrubbery. It also helps to reach high tree limbs and other hard to reach areas around the house. The machines reduce the product to small microns and knock off the adult mosquitoes from their resting sites. 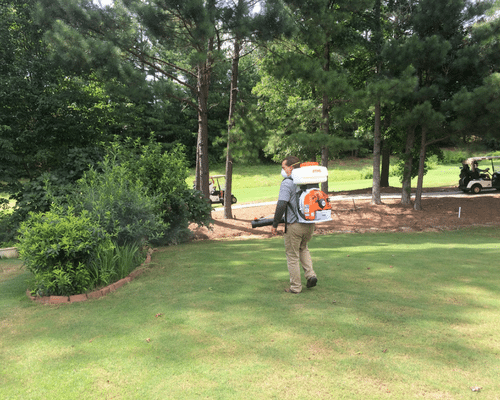 We use blower-sprayers on all of our monthly mosquito treatments at Prime Pest Solutions. We have found, from experience, that using this method of treatment greatly reduces the amount of adult mosquitoes around your home. Follow-up- Prime Pest Solutions will work with you to make sure that you are completely satisfied with our mosquito services. Although complete elimination is not to be expected, our goal is to make sure that the population is reduced enough that you will surely see an improvement in the numbers of mosquitoes around your home. Prime Pest Solutions always recommends using topical repellents with DEET while outdoors. Mosquitoes are carriers of many dangerous diseases. West Nile Virus, Malaria, and Zika Virus, just to name a few. Call the mosquito control experts at Prime Pest Solutions to help protect your home and family 770-962-4240.